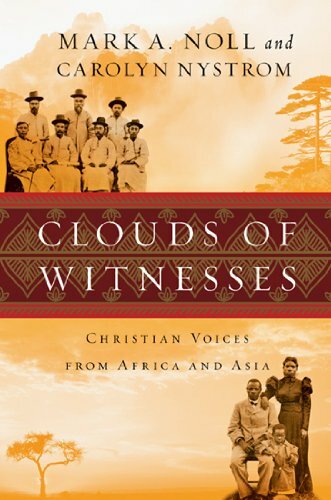 My review of Clouds of Witnesses by Mark Noll and Carolyn Nystrom has been posted on Out of Ur. I’m seated at the front of a university lecture hall with representatives of five other religious traditions. Listening intently to the brief descriptions of our faiths are seventy undergraduate and graduate students, many hailing from other countries. Two weeks later I’m attending a global theology conference at Wheaton College. Presenters describe the theological landscapes in their countries, and it is apparent how significantly these contexts are shaping how evangelical theology is articulated. I am being a bit snarky; surely Christians around the world ask questions about hell, judgment, eternity and… Rob Bell. However, it was unmistakably clear in both environments that the questions American Christians so passionately debate are not always asked by those who don’t share our cultural context. When, as I recently read, a prominent Christian claims that the questions raised by Rob Bell and his critics are the questions being asked by Christians, I wonder which Christians we have in mind. I fear our debates sound myopic to those outside the American evangelical subculture. I wonder too whether our ignorance of the questions and concerns of the larger church—down the street and across the globe—limits our opportunities for robust fellowship and mission. Read the rest at Out of Ur.